Click on the cover—or scroll below—to read a free preview! Published in 16 volumes (and still ongoing) under the Japanese title Seinto oniisan in Japan, Saint Young Men goes on sale April 23, starting with Volume 1, and with subsequent volumes to be released monthly thereafter. 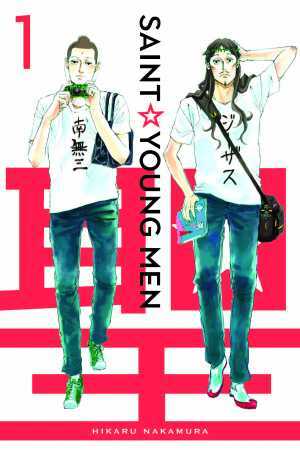 Saint Young Men will be available on all of Kodansha Comics’s partner digital platforms, including Amazon Kindle, Apple Books, BookWalker, comiXology, Google Play, Kobo, MyAnimeList, and nook. Volume 1 also features a specially-penned afterword by British Museum curator Nicole Coolidge Rousmaniere. “Who would have thought that Buddha would have a passion for manga? What Nakamura has managed to do with Saint Young Men is to entertain, stimulate and keep us addicted to this wonderful friendship that never fails to make you see life around you slightly differently as a result,” writes Rousmaniere, who helped acquire pages from Saint Young Men for the British Museum’s nascent genga collection. For an advance review copy of Saint Young Men, visit the Kodansha Comics page at NetGalley or contact pr@nullkodanshacomics.com.